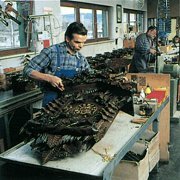 We combine the century-old craft of the Black Forest clockmaking with new ideas, thus being able to serve our customers wishes. 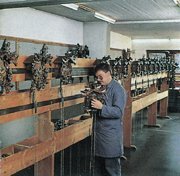 Our extensive program is constantly enlarged by new models to maintain the tradition of the Black Forest clock. 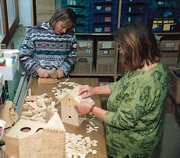 Our cuckoo clocks are manufactured not as mass-production, but as hand-assembled masterpieces. 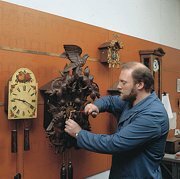 It is our company's philosophy to use for our clocks only high-quality movements, wood-carvings and clock cases, all produced in the Black Forest in Germany. 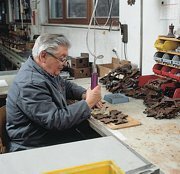 The clocks are known around the world for Black Forest's high quality workmanship. 1. The wood-shingles covering the roof of many clocks are cut. 2. Then glued-on by hand. 3. All wood-carvings are handmade by master-carvers in the Black Forest. 4. 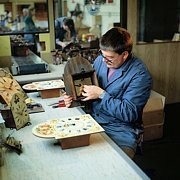 The wood carvings for all clocks are made individually. 5. 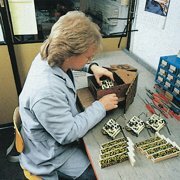 The assembly of the clocks is also done individually. 8. ...as well as into our Black Forest Wall Clocks. 10. ...and controlled by our expert clockmakers before they are shipped-out to our customers.